With Volusion's Instant Postage feature, you can purchase and print USPS postage right from the Order Details page. Best of all, get access to special discounted rates that save you up to 40% off regular postage prices! Click the Get Started button to begin the setup process! STEP 1: Create a new Stamps.com account to set up Instant Postage. If you already have an account, enter your username and password here. ❗Note: Connecting an existing Stamps.com account will convert it to a Volusion partner account, which will waive your Stamps.com subscription fees and reset your account features in Stamps.com. If you prefer to keep your existing Stamps.com features, we recommend creating a separate free account to use strictly with Volusion’s Instant Postage feature. If you don’t have a Stamps.com account, click Sign Up to create one. STEP 2: Add funds to your Stamps.com account. 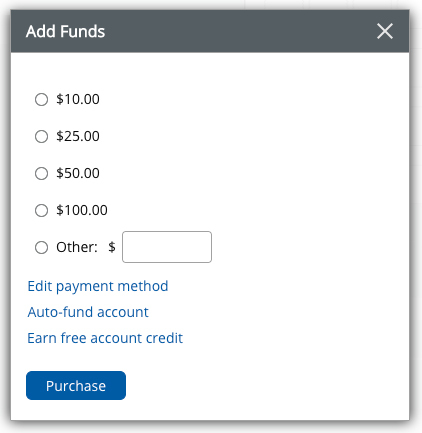 The minimum balance required to print a label is $10, so we recommend adding funds to your Stamps.com account as soon as you've created it, and maintaining that minimum amount in there at all times. To add funds from your Stamps.com dashboard, go to Balance > Buy More. You'll see the options to add a fixed amount or to automatically fund your account. STEP 3: Connect your Volusion store to Stamps.com. Once you've created your Stamps.com account and added funds, go back to your Volusion store. With your Stamps.com credentials handy, enter the username and password in your Volusion Admin Area and click Connect. Once you connect, your Stamps.com account will be converted to a free partner account, and Stamps.com subscription fees will be waived. This area also contains a handy link to manage your Stamps.com account details at any time. In the dialog box that displays, you'll notice that the shipping origin (Shipping from), shipping destination (Shipping to), and package weight are automatically populated based on the order details. Confirm that you've added a Company Name, Phone Number, and that your state is in a two-character abbreviation format. These fields are required and will result in an error if you leave them empty or enter them in an invalid fashion. If you need to edit any of them, click the blue Edit links or manually enter a new weight. Note that the Shipping from address is automatically populated from your Ship From Config Variables. To edit this value, go to Settings > Config Variables. From there, search for "ship from". Shipping destination and package weight are automatically pulled from the order, and are sent to Stamps.com to calculate rates. The maximum weight for First Class is 15.9 oz. For all other USPS shipping methods, weight limits vary between 15 lbs and 70 lbs. To prevent USPS from rejecting labels, confirm the package weight is correct before proceeding. If you have special considerations, you can use the Optional Fields section to account for them. If you'd like delivery insurance, use the Insurance menu to select the carrier's default. You can also enter the package value that you'd like to insure. Finally, you can enter custom text in the Reference Message field. Note that it may not display on all USPS label formats. Next to Service, click Choose Method to select a shipping method. The rates that appear here are not dependent on the methods you've activated for your customers. Instead, these are all the available USPS rates that your account and your shipment qualify for. (Note that only domestic shipping rates are available for postage printing at this time; international addresses are not supported.) Once you select a method, click Update. You'll see the new rate and delivery time in days. The Label Layout field lets you choose your preferred layout option. Choose Letter or 4x6. After you create a label, funds will be deducted from your account, and a live label will be available for you to print. Before proceeding, confirm the following: you have sufficient funds in your Stamps.com account; the shipping origin, shipping address, and package weight are correct; you've selected your preferred shipping method. To complete the purchase for this shipment, click Create Label. Your label will automatically load in a new browser window. Additionally, the details from your postage label, including the tracking number from USPS, will automatically appear in the History tab of the Instant Postage section. You can also view the label (and previously generated labels) by clicking on the eye icon. Once you mark the order as Complete, an OrderHasShipped email with the tracking number gets sent to the customer. You can disconnect your account from your Volusion store at any time. Note that when you do this, you'll lose access to any discounted rates you had through Volusion, and you'll be charged $15.99 monthly by Stamps.com. We recommend contacting Stamps.com directly to cancel your account if you no longer plan to use it. Go to any Order Details page in the Admin Area. In the Instant Postage section, click Manage Account > Disconnect. When asked to confirm your selection, click Disconnect. You'll see a confirmation message letting you know that your account has been disconnected. The feature is free to use. You only pay for postage charges. The Stamps.com charge of $15.99/month is automatically waived for accounts that are both connected to a Volusion store and using the Instant Postage feature to create labels. Upon registration, you may receive a welcome email from Stamps.com that mentions a $15.99 fee, but you can disregard that email. It's an automated email gets sent before your account is connected to Volusion. If you have concerns about your account being charged, call Stamps.com support at (877) 782-6739 (option 1) (Hours: M-F, 6am to 6pm PT), and let them know you're a ShipEngine / Volusion customer. What rates am I getting? Can I see rates before I sign up? Yes. From the Instant Postage section on any Order Details page, click Preview Rates. Enter shipping origin, shipping destination, and package weight, then click Get Rates. What if I already have a Stamps.com account? If you already have a legacy Stamps.com account, your monthly charges will be waived once you connect the account to your Volusion store, and you'll automatically get access to Volusion's discounted rates. If you've negotiated lower rates with USPS through an NSA, your lower rates will still be honored, but you'll also have your monthly fee waived! Note: The Volusion/Stamps.com plan only allows you to print from the Volusion Admin Area. If you plan to continue printing from Stamps.com directly, you'll need to remain on your existing $15.99 monthly plan. Connect your account to Volusion and contact Stamps.com Support at support@stamps.com to have your account moved back to your original billing plan. How do I get a refund on a label that I no longer need? You can request a refund directly from Stamps.com. From your Stamps.com Online account, go to History and select the order to be refunded, click the Refund icon, then follow the prompts to request a refund. Details can be found in the Stamps.com Learning Center. Can I print postage for international destinations? At this time, the Instant Postage / Stamps.com integration only supports label printing for domestic addresses. Any postage labels for international recipients should be purchased and printed separately. I have to enter a phone number or company name each time I purchase postage. Any way to get it to automatically enter the name and phone? Yes. In your Admin Area, go to Settings > Config Variables. From there, search for "ship from". In the results, you'll find Ship From Company and Ship From Phone. Use these variables to set the values you like. Once you save, they'll automatically populate to the Instant Postage feature.